Wood sanders like the drum sander do not always get as much attention as other power tools such as power saws, drills, and nailers. And some woodworkers do not even think they are essential to have in the workshop. But, whether you are DIYer, woodworker or hobbyists, a reliable and efficient sander such as the drum sander is a must-have for finishing your projects. As the name suggests, drum sanders are the kind that comes with a drum/spinning cylinder covered with replaceable sandpaper. These sanders also have a conveyor belt for feeding the workpiece to the sander head. Drum sanders come in open and closed design, and in single or dual drum and they are best drum sanders for finish sanding and when working with large boards. However, to get good service from these sanders, you need to pick the best drum sanders from the various options. And this requires you to consider factors like the types, motor power and speed. This piece makes it easy to choose a drum sander by reviewing some topnotch units and also providing all the information you need to know before and when buying one. The amount of material that drum sanders and planers can remove is one of the main things that set them apart, and it is also their most significant difference. While the job of a planer is to plane the workpiece, the drum sander is for sanding it. And what this means is that the planer is ideal when you want to remove a lot of materials such as when leveling glued wood or surfacing stock. A drum sander, on the other hand, is best for finish sanding and also for fine surfing. Typically, planers will remove between 0.125 and 0.250 inch of materials with every pass. The drum sander will remove between 0.005 and 0.007 inch of materials for a single pass. And so you would have to make about 25 passes with your drum sander to remove the same amount of material as you would in a single pass when using a planer. Another significant difference between the two is that a drum sander can deal with quite thin stock such as veneers which can be hard to work on with a planer. Also, planers are small and relatively affordable in comparison to the drum sander which can be massive and quite pricey machines. There is no doubt that a drum sander will be a great addition to your power tool collection, and it will make some of your projects easier. However, it is still important to understand the actual benefits to expect when you buy one. These benefits of having a drum sander include the following. Efficiency. 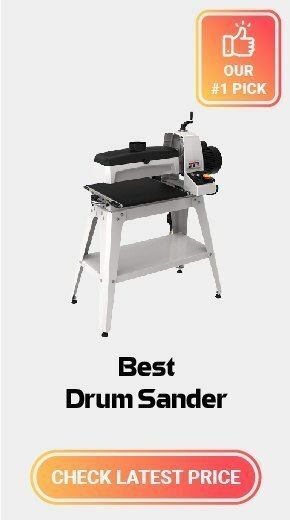 Drum sanders are highly efficient sanding tools as they make it possible to sand your workpieces faster than you would when using handheld sanders. Unlike other types of sanders, they feature a conveyor belt that moves the workpiece fast through the sander to ensure that you always get professional and consistent results. Huge sanding capacity. A huge percentage of the drum sanders in the market will be open-ended, and this will provide a huge working space even if the machine has a small footprint. Also, drum sanders tend to be large and with big tables to accommodate huge workpieces. Convenience. Modern drum sanders are one of the most convenient sanding tools you can have in the workshop. Some will have a stand for protecting your back when standing, auto adjusting conveyor belts to suit your workpiece, and also varying feed rates to make it possible to smooth different stock types without running them. You can also read other sander reviews such as Jet 629004K drum sander, Supermax 19-38 drum sander, random orbit sander, belt sander, belt-disc sander, spindle sander, palm sander, detail sander, and sanding belt guide. Jet 723520K is a great drum sander for woodworkers that are looking for a high performing model that does not cost much. Although it has one of the smallest motors on our drum sander reviews, it still produces enough power for most sanding projects. It comes with a 16-inch drum size and with a variable speed control that makes it easy to select the optimal feed rate according to the project. And it is also one of the lightest models on our list which makes it easy to move around the workshop or between worksites. This drum sander comes with a 43-inch long conveyor table with a parallelism adjust dial for returning the conveyor belt to a flat position quickly. Users can reset and measure the sanding depth for every project. The conveyor belt on this drum sander is redesigned to pull the workpiece through the sander instead of pushing it to increase the efficiency. There is also 4-inch dust port on this drum sander and it comes with a handy dust wood for easy wood dust management. Any professional woodworker that is ready to pay more to get a top notch and a highly reliable drum sander will love the Shop Fox W168. It is the priciest model on our list but you get what you pay for as it runs on a powerful 5.0 HP motor that will deliver a speed of 2300 rpm and variable feed rate with a maximum limit of an impressive 20 fpm. The 26-inch drum on this sander is also the largest on our list and it makes it a great choice when dealing with large stocks. Shop Fox W168 is a dual drum sander that provides a fast and efficient system and the rear drum is micro adjustable. Also, it uses a hook and loop sandpaper attachment that makes the paper change quick and easy. Other features that make this a great drum sander include the convenient multi-control panel, hinged hood, a couple of 4-inch dust ports and durable industrial rubber conveyor belt. Space is always limited in most workshops, but this should never stop you from buying a drum sander as you can always go for the mini Jet 628900 benchtop sander. It is one the best drum sanders for small shops as it does not take up a lot of space, and it is also quite affordable. But despite the affordable price tag and compact design, this is still quite a high-performing sander. And it also has various mechanisms that help to make it quite a convenient sander. They include the large hand wheel that makes adjustments easy and the quick paper change design to minimize downtimes. Its 1 HP motor is the smallest on our list, but it is still quite substantial for a benchtop drum sander. This motor provides a speed of 1,700 rpm and the drum sander also has a variable feed rate of 0 to 12 fpm. And it will still provide relatively fast stock removal which makes this the best cheap drum sander on this list. Like the other drum sanders on our list, it will also come with a 4-inch dust port for easy collection of wood dust when sanding. The SuperMax 19-38 is a fantastic drum sander with a variable feed rate, and it will be a great addition to your power tool collection as it will take care of all your sanding needs. The manufacturer makes it to address common drum sander problems such as difficulties in alignment. With this sander, alignment is as simple as adjusting one nut. Also, the SuperMax has an indexed alignment setting that will cater for both wide and narrow stock, and the 47-1/2 inches long and 22-inch wide conveyor table is also enough to handle all your workpieces. And to make this a comfortable drum sander to work with, it has an easy to use height adjustment mechanism that will alter the height smoothly and quickly. In addition to all its impressive features, this drum sander also uses technology to adjust the conveyor speed automatically which is a handy feature when dealing with different stock types and sizes. If you are one of the many woodworkers and hobbyists that value the appearance of a power tool almost as much as its performance, the Powermatic PM2244 will be a perfect drum sander for you. And this is because it has a very appealing look. But besides from the sleek finish, this drum sander also features a top-notch construction with cast iron drum carriage and a sturdy steel hood. It has a 22-inch drum size to accommodate wider stock and a variable feed rate of 0 to 10 fpm that makes it ideal for sanding various kinds of stock. The Powermatic PM2244 is the second priciest unit on our list and also one of the bulkiest. However, it does not take up as much space in the workshop as one would expect. The built-in feed logic is also a great feature as it not only provides an exceptional finish but also ensures that the machine does not overload. As you shop for the best drum sanders, there are some vital points that you need to keep in mind. One of the essential ones is the different types in the market. Overall, you can classify drum sander into either closed or open end based on the structures that house the sanding mechanism. But, you can also classify them into two subtypes which are single or double drum sanders, and this is according to the number of drums on the sander. As the name suggests, the closed end drum sanders are the types where the structure that supports the sanding drum, feed belt and pressure rollers will be closed on both ends. This design makes it impossible to sand boards that are wider than the length of the drum. For example, if you have a 12-inch closed end drum sander you can only use it to sand boards with a maximum width of 12 inches. Although these sanders will limit the width of the board that you can sand it is still possible to sand two pieces separately and glue them together. Another important thing to note is that although these sanders limit the size of workpieces that you can sand, they are more stable than the open-ended types. And this is because the roller will not flex open or apart. If most of your projects entail using large boards the open end drum sander is one of the best sanding tools for you. With these sanders, the structure that houses and supports the conveyor belts, sanding drum and pressure rollers is open at one end. The open end design makes it possible to use these machines to sand boards that are wider than the length of the drum. If you have a 12-inch open end drum sander it is possible to use it to sand stock that is up to 24 inches wide. But, there is a major flaw with this drum sander design that can affect its performance. And this is the fact that the open end tends to flex under pressure and hence causing uneven sanding. The single drum sanders are the oldest type and still the most popular between the two. And they are the kind that only comes with one sanding drum. With these sanders, you are limited to just one sandpaper grit and so if you intend to use more than one for the sanding project, you have to keep changing the strip. The greatest advantage of the single drum sanders is that they have a rather basic and easy to use design and will in most cases come at a lower cost than the double drum models. Double or two drum sander will come with two sanding drums just as their name suggests. And one drum will be just behind the other. The greatest advantage of these drum sanders is that they allow you to run two sanding strips with different grits. You can have a rougher grip on the first drum and a finer one on the second one for more efficient sanding and to speed up the process. And as handy as these sanders might be, this design is more complicated than the single drum units and will also cost more to buy. Now that you know the basics of the drum sander, from the benefits of having one to the different types, the next important step is to know how to pick one. The detailed drum sander reviews above highlight some of the best models and brands to go for but to pick between them you need to consider the vital points below. Drum sanders might not be the priciest power tool but they are still quite an expensive investment. And so you need to make sure that you get the best quality drum sander. When it comes to the quality you need to check the construction of everything from the housing to the drums, pressure rollers, and even the feed belts. How much you are willing to spend on a drum sander should be one of the things in your mind when shopping for one. While it is possible to get one for a few hundred dollars, some of the more powerful ones with some amazing features and capabilities and from reputable brands will cost well over $1,000. Go for something that is within your budget or at least at a reasonable price tag but makes sure that you never compromise on the quality and features just to save a few bucks. The motor power is always a crucial factor to consider when buying any power tool. Hence, it is also one of the essential things to watch out for when choosing drum sanders. Most will have a motor power of between 1 and 5 HP, but the more powerful the sander the more money you will have to pay to own it. Also, check on the voltage limits in your home before buying a drum sander as it can be unfortunate to end up with a 240-Volt machine when you are limited to 120 Volts. Capacity determines the size of material that your drum sander can handle and it is a crucial factor to consider. And open end drum sander provides a large capacity and it will be great for woodworkers that deal with the large board. However, the large capacity comes at a cost as these machines are less stable than the closed end ones. Hence, it is important to determine what matters most to you between large capacity and stable, uniform sanding. Speed is another vital point to keep in mind when shopping for a drum sander. And the best ones are those that provide a variable speed and feed rate. Being able to adjust the feed rate is a great advantage as it will allow for a variety of uses. While some tasks require slow speeds other will require fast passes to produce the results you desire. There are different drum sander types in the market. And we highlight the different ways of classifying them above. The right drum sander for you depends on your particular preferences, budget and also the projects that you do more often. For example, if you work with large boards and are looking for something efficient that makes sanding quick and easy for you, a dual drum open-ended drum sander will be the best pick for you. A drum sander is not a hard power tool to use and any seasoned hobbyist or woodworker should not have any difficulties figuring things out. However, there are also a few things that you can do to improve your drum sanding experience. Here are some handy tips and tricks to help you out. Choose your paper wisely. Even if you get the best drum sander it will only serve you well if you have the best paper on the drums. Instead of going for cheap ones you should go for premium paper for more efficient sanding and desirable results or even just to avoid frustrations. Take your time. Drum sanders do not remove a lot of materials with every pass like planers. And so to get the best results you need some patience. Setting the belt at maximum speed and taking numerous light passes produces the best results. Get a dust collector. Sanding produces a lot of wood dust and so you should never use your drum sander without a dust collector. Having the dust collector not only keeps the work surface clean but also improves the performance of the power tool. Never sand through brads. When sanding a workpiece that you have attached with fasteners you should be careful not to sand all the way to them. Doing this can leave some lines in your sandpaper which will then be transferred to the next stock that you sand. Sanders come in many shapes and sizes and with different capabilities. However, when it comes to sanding large workpieces the drum sander is one of the best options. Although it might not be as common as a planer and other sanders, it is always a great addition to any workshop. But, this is only true if you get the best drum sander. The drum sander reviews above provide some ideas on the models to buy. And if you combine them with the handy buying guide, you should be able to pick a drum sander for your projects will minimal difficulties.